Aaaaaand we’re back. We hope you’ve liked the changes announced for the wiki and issue view already, but today we’re showing off another awesome feature in 3.3 that will likely change your issue tracking workflow for the better: @mention support! If you’ve used twitter, facebook or any other social application in the past few years, you’ve no doubt seen support for mentioning users by typing an “@”, followed by the username. Read on to see how the @mention support will make interacting with other users in The Bug Genie easier! One of the other cool new features in 3.3 is the user notifications popup, which notifies you (almost) immediately when there is something that requires your attention. Actually, you can define which items will trigger a notification, but potentially anything that is interesting will be shown in the notification area. Building on this notification area, the @mention support will (as you can see in the screenshot above) notify a user that he/she was mentioned and should probably take action. Also visible in the screenshot are links to all interesting items in the notification – the user who mentioned you, the actual comment with the mention, and the related item such as a wiki article or an issue. Mentioning another user is super simple. 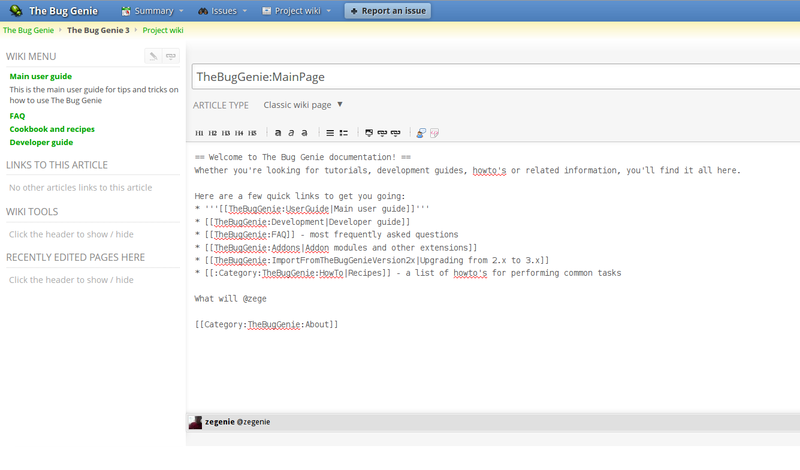 You can mention any user that you know the username of, and The Bug Genie will also try and help you out (for performance reasons, not all users will be suggested) when you’re trying to mention users. For instance, when posting an issue follow-up comment, The Bug Genie will automatically suggest names of users involved in the issue or project when you try and mention a user, whereas when you’re writing an article comment, users involved in the article will be auto-suggested. Also, your friends and anyone in your team(s) are also included in the suggestions list. 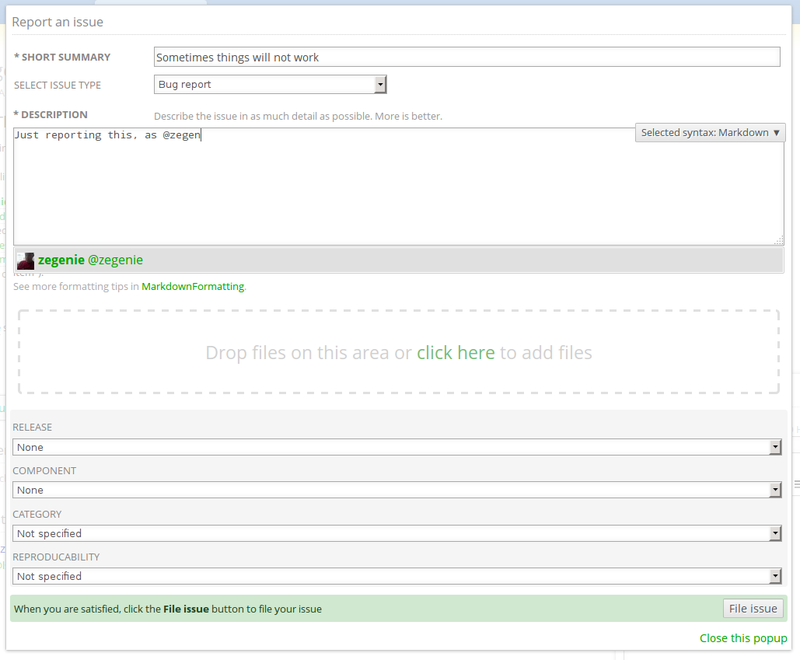 Hopefully you will see how this improves interaction between project members, team members and your contributors. Feel free to let us know what you think in the comments! Next Post Dashboards: new and improved! Very interesting addition. I also noticed the change made for adding files to an issue. Yet another interesting feature. Thanks Daniel. great work! 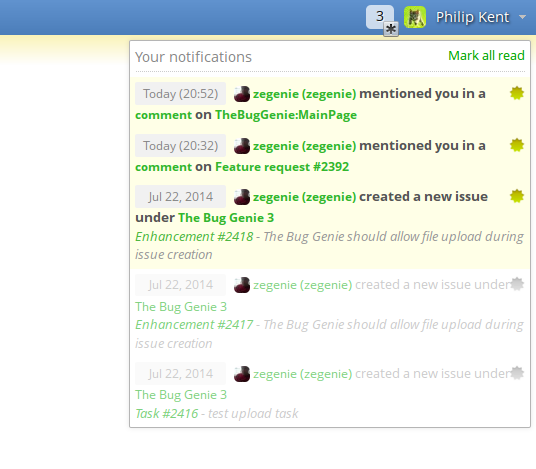 will it be working from within the git commit as well (so I can add notification of a commit ) ? Awesome! I think the notifications of @mention in commits convinced me to migrate to a version control system which can be integrated with the commit integration feature of TBG more easily. Currently I’m making use of the Assembla Free Plan (https://www.assembla.com/plans) and it can not be integrated in TBG unfortunately.